A packed house at a recent candidate forum for Ward 3 city council candidates. It’s an understatement to say that this year has been interesting for West St. Paul politics. Earlier this year a dust-up over a committee appointment revealed a longstanding pattern of sexism directed at Mayor Jenny Halverson, the first woman to hold the post in the city’s history, as well as numerous other women who say they’ve been marginalized by their city council. The ensuing testimony spanned more than two hours and generated local and national media coverage. In response to this, two women have stepped up to run for city council in Ward 3, which includes Smith Avenue. And in response to that, two men have stepped up in an effort to prevent them from succeeding. One of those candidates, former mayor David Meisinger, has a documented history of sexist actions and other questionable behavior, as outlined by local blogger Kevin Hendricks. John Ramsay, another candidate in the race, has not condemned or disavowed those actions, and indeed the two candidates filed on the same day and have yard signs of the same design and typeface, suggesting the campaigns are clearly aligned. As an example of this commitment, Eng-Sarne and Berry were the only candidates who committed to attend a recent candidate forum held at city hall (Berry had to change plans because of a death in the family, but later answered questions in a Facebook event). Meisinger said he had a conflict, Ramsay simply ignored the invitation. And so this primary election is assuredly a referendum on sexism. But that’s not all it’s about. As the High Bridge reopens this fall and a new high-profile restaurant arrives in the neighborhood, the Smith Avenue neighborhood is at a critical juncture. The neighborhood needs representation that will be responsive to citizens and attentive to community frameworks that have been developed in the past. How our city is represented to potential developers and prospective homeowners matters too. This blog does not plan to endorse a particular candidate, but I encourage readers to research and reach out to the candidates and ask them about their vision for the neighborhood. Local elections have a major impact, and if you haven’t been paying attention in the past, there’s no time like the present to get involved. Also, vote! First, determine if you live in Ward 3 (a roughly L-shaped swath including everything west of Charlton and everything south of Marie). Then, find your polling place or vote via absentee ballot at the Dakota County Services Center. You can only vote for one candidate, the top two will advance to the general election. This is a non-partisan race. A renowned local chef wants to breathe new life into this vacant space on Smith Avenue. Robert and Ann Ulrich, the owners of Mendoberri in Mendota Heights, are planning to open a new restaurant called FoodSmith at 973/975 Smith Avenue. The building, which until recently was home to Deckci Deco/Cici Events, had previously been vacant for several years. In their application, the Ulrichs say they have an agreement to purchase the building and plan to open a “bistro-pub” concept, focusing on a chef-driven menu along with beer and wine. The Ulrichs also highlight how their restaurant will help realize some of the goals of the Smith Avenue Revitalization Plan by introducing a new dining option along with outdoor seating. Last week, the West St. Paul planning commission unanimously recommended approval of a liquor license and a permit for the outdoor seating area. As indicated in the planning commission’s report, some neighbors have already started complaining about parking, even though the owners are working to secure an agreement with the Doddway shopping center across the street, which has abundant parking in the evening. The West St. Paul City Council will take up the issue tonight in a public hearing, as part of the regular meeting that starts at 6:30 p.m. Please show up, or call or email Ward 3 council members John Bellows and Dave Napier if you support this new restaurant and want to see it approved. It’s really happening – the High Bridge will officially close for construction in just a few weeks. Starting September 5 the bridge will shut down for 16 months so the deck can be rebuilt and reconfigured. In addition to being safe for continued automobile traffic, the new bridge will feature bike lanes and protected sidewalks. The official detours will route northbound traffic to downtown via Robert Street, and southbound traffic to Interstate 35E and Highway 13. The section of Wabasha between Fillmore and Plato (just south of the bridge) is still closed and is not scheduled to be completed until October, but if you’re on foot or bike that’s still your best bet to get downtown (the Wabasha bridge itself is still open and can be accessed via Water Street). This obviously will be an inconvenience, but given the scale of the project it’s not exactly apocalyptic. Google Maps estimates a trip from the Capital View Cafe to Bad Weather Brewing is about 3 minutes by car over the High Bridge. Routing through downtown via Robert Street turns that into a 14 minute trip, and when the Wabasha bridge reopens it goes down to 11 minutes. If you’re going from the West Side to, say, Grand and Victoria, you go from a 7 minute trip with the bridge to 13 minutes via 35E (those times will obviously vary based on traffic conditions). The project will also involve short-term closures of Shepherd and Lilydale roads along with the dog park and adjacent trails, details are on the project page. MnDOT is holding two open houses this month to talk about the construction schedule and local impacts. The first will be Wednesday, August 16 from 5 p.m. to 7 p.m. at the Capital View Cafe, the second will be Tuesday, August 22 from 5 p.m. to 7 p.m. at Bad Weather Brewing. The work is currently scheduled to be completed in December 2018. 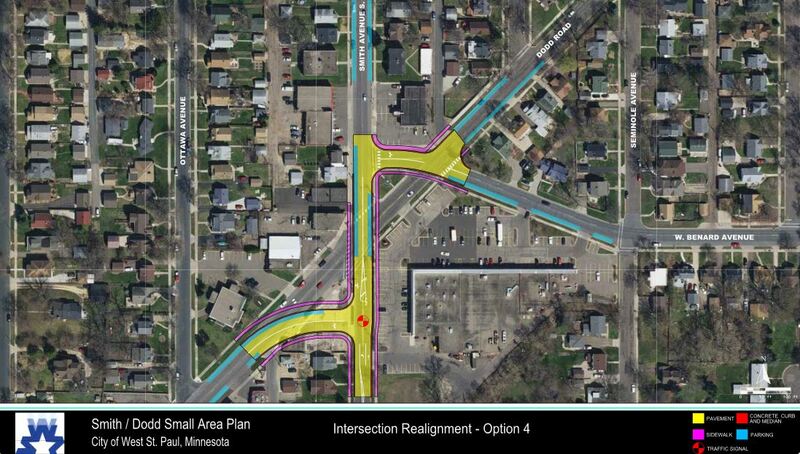 This year, the city is convening an advisory committee to discuss options for realigning the Smith/Dodd intersection – a confusing knot of three arterial streets and multiple curb cuts and driveways. The process is looking not just at the intersection but surrounding land use and zoning, and helping to envision what the area will look like long term. The group is incorporating recommendations from the 2010 Smith Avenue Revitalization Plan (three of the former task force members are also on the current committee). Most visibly, the process will make recommendations for the city-owned 1010 Dodd property, the former auto repair shop on the southwest corner of Smith and Dodd. It may be absorbed into the street grid or redeveloped as commercial or park space. What’s wrong with the intersection as it is? The two main problems are that it can be confusing and difficult to access businesses and that the intersection is particularly dangerous for pedestrians. It’s all subjective, but most people I’ve talked to who walk in the area say they’ll jaywalk midblock rather than take their chances at the crosswalk, where drivers often make turns on red lights at high speed. The group includes some area residents, representatives from businesses including the Doddway shopping center, Zak’s Auto Repair, Camelot Cleaners, the Cherokee Tavern and Amore Coffee, and Ward 3 council member John Bellows and planning commission chair Morgan Kavanaugh. I’ve heard there’s going to be a roundabout. Will there be a roundabout? Possibly – that’s only one of the design options under consideration. A recent meeting explored the idea of dramatically remodeling Doddway and replatting the streets entirely – something that probably won’t happen because it would be considerably expensive. 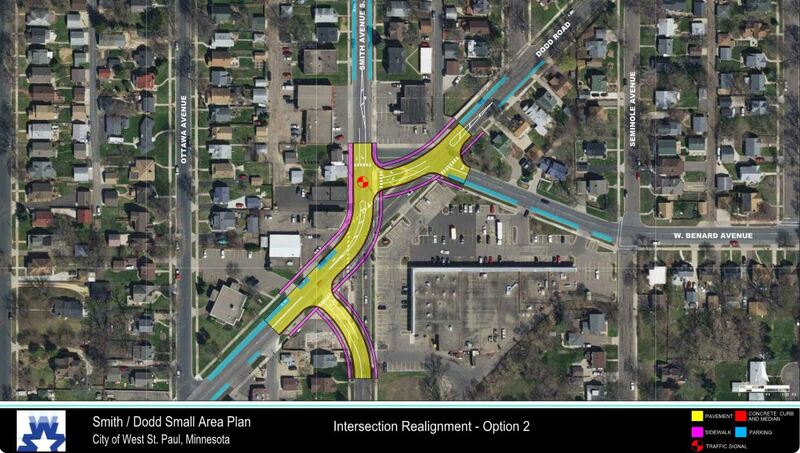 It’s also possible the intersection won’t be changed at all. The process is not to choose between roundabout and not-roundabout, it’s to help city staff and engineers understand what the community regards as most important. That includes safety, preserving parks/open space and existing businesses, access to businesses, etc. So the end result will (hopefully) be a design that incorporates all of those concerns. What about Albert Park or the Scott Patrick memorial? Some design concepts relocate Albert Park while others keep it in its existing location. All of them include public/open space that could be used for a memorial for Officer Patrick. When can we expect to see some changes? Years from now, if ever. The project depends on unidentified future funding, and will likely be in the range of $1 million-$3 million. But isn’t MnDOT about to redo the whole road? Yes, and while they’re making improvements to intersections in St. Paul and Mendota Heights, Smith/Dodd will only see sidewalks and ramps brought up to basic ADA compliance. 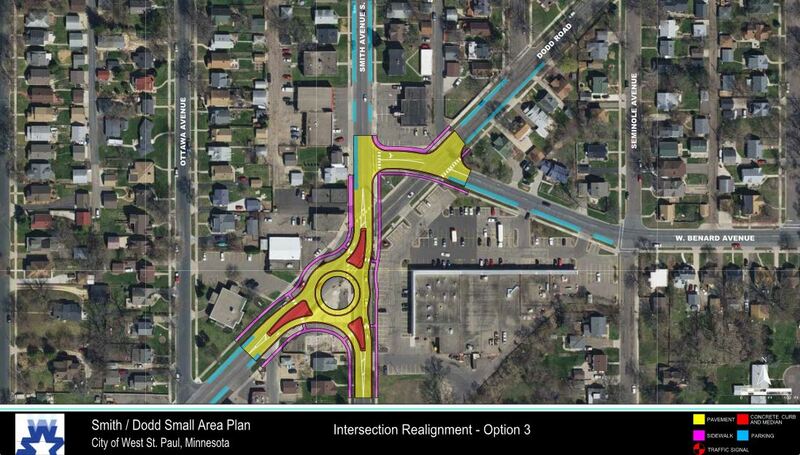 City staff are still pushing MnDOT to see if any incremental improvements can be made at Smith/Dodd as part of this project but no luck so far. There will be a series of open houses, most likely in August, and recommendations are expected to go to the city council in November. You can always submit comments to your city council representative.